When something is very common, when it's overly familiar, you can can stop seeing it, you can miss it entirely, in fact. So what are we looking at in this photograph? A row of conservative men in Louis Copeland suits, who are replacing, it should be pointed out, a row of conservative men in Louis Copeland suits. There's hardly a hairs breadth of difference between the center-right politics of Fine Gael and the center-right politics of the Fianna Fail party they're replacing. Once elected, they'll listen to the public's demands to renegotiate the EU-IMF deal, and they'll be asked to burden the bank bondholders with some of the debt currently foisted on the Irish tax payer. But, with the election over, expect all that talk to eventually fade away inconclusively. Budgetary policy has already been determined, austerity will be the watchword. Besides, Fine Gael argues that 73 percent of its deficit reduction program should be paid for by spending cuts and 27 percent in new taxes (so it's another bailout, essentially, but this one will bite harder). Tribal politics, crony capitalism, Civil War party affiliation, they haven't gone away you know. Looking at this shower in their silk ties and bespoke tailoring is a bit like looking at a double negative, there's so little between them and the ones they're replacing. No visionary game-changing Obama-like politician has emerged on a wave of angry populism to lead the nation in a new direction because for generations the Irish political establishment have rigged the game there to protect their interests. Even a crisis of these unimaginable proportions hasn't lead to riots, or vast public protests, or to a comprehensive reordering of our all too obviously gamed political system. Foreign observers are mystified, but the Irish themselves are not. Because the unwritten rule of Irish society, since the foundation of the State, is this: put up or ship out. Critics aren't welcome. In fact, they're unpatriotic. Call it the Panglossian school of Irish political thought. It's never been publicly formulated, but we learn it by heart early on. Fine Gael's election slogan was "Let's Get Ireland Working." That phrase was astoundingly cynical, in the current context, when you realize that 28 percent of the nations best and brightest young people are already planning to emigrate as soon as they return their graduation robes. The men in this picture, like so many of our political leaders, are the type of men who only know how to talk to each other. Everyone else leaves them uneasy or perplexed. Don't expect surprises from them, today or ever. This isn't a picture of visionary progress and transformation we're looking at. 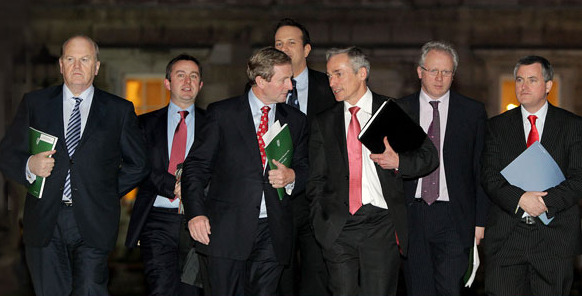 It's just a snapshot of a seven conservative men in flashy suits that cost more than most Irish people make in a month. Behind them, off camera, is a slap-happy nation sleepwalking into a lost decade of emigration, massive debt-repayment and social and economic stasis. And it was all delivered courtesy of a center right government and it's high flying pals in the property and banking sectors. They ran Ireland like a fraternity house casino. They stuck the rest of us with the bill. If the Irish can't see the point of change today, they probably never will.